In the first part of this series we discovered that the ideal bowling green soil (or rootzone) will be 50% space, 5% organic matter, with the remainder (45%) being made up of mineral matter, namely Sand, Silt and Clay. These are the 3 universal mineral components of soil. Part 1 finished with an explanation of the soil fractions, 5 of which were sands of varying sizes. In part 2 we found out a little bit more about sand and it’s behaviour as a drainage medium and we discovered a little more about how soils are formed. We finished by looking at the importance of sand particle shape and size in bowling green rootzones. Last time we saw how the perfect bowling green’s soil volume will be 50% space called porosity. We discovered that half of that pore space (25% of the soil volume) should ideally be filled with air (macro pores) and that the other half (again 25% of the soil volume) is for water (micro pores). We finished last time by discovering that the mineral part of the soil is actually made up of a lot of different sized soil particles called the Soil Fractions. Today we’ll try to get a better handle on Soil Texture and discover how some of the soil fractions come about. In particular we will look at the complexity of sand, before getting a better understanding of how soils are formed in the first place. This will help us to understand the importance of sand in bowling green maintenance, but hopefully also to understand more fully, its limitations. 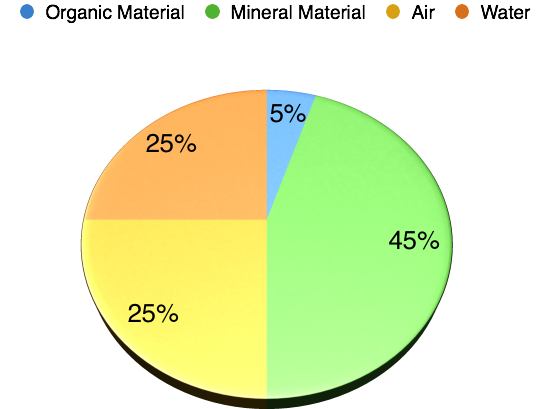 In bowling green Nirvana, out of the remaining 50% of the soil volume, 45% would be Mineral and 5% would be Organic Matter. Today I want to concentrate on the 45% Mineral matter as this is where we can really influence the performance of our greens. Bowls Green Soil Texture part 1. 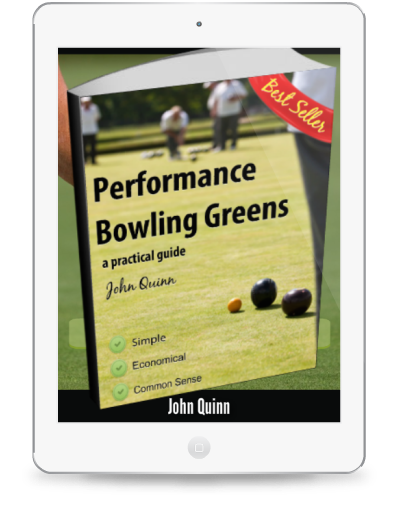 This subject is so important to the future performance of bowling greens that I would say it is essential for greenkeepers to understand this subject over any other. The physical condition of the soil in the bowling green is the most important aspect of bowling green maintenance because it impacts every other aspect of green management. The physical properties of your soil dictate everything from drainage, nutrient availability and pH right up to green speed, green smoothness, consistency and ultimately whether or not the green performs to a high standard. But what do I mean when I say Soil Physical Properties? This is primarily about 2 distinct qualities of the soil, Texture and Structure. Soil Structure relates to the way the soil holds together and there can be no doubt that soil structure plays a big role in green performance. However, soil structure is largely dictated by Soil Texture and for that reason I believe that the Soil Texture is the single most important aspect of green maintenance for greenkeepers to understand. Unfortunately, in my experience it very rarely is understood sufficiently to give the greenkeeper enough confidence in creating a program of work that majors on getting this right. But what do I mean by Soil Texture? No, this isn’t just the question you ask your daughter about the spotty youth she has brought home for tea; it’s also the phrase that describes the make up of all soils. More accurately, soils are made of a base Mineral material mixed with Organic (dead animal and vegetable) material . The mix of the two dictates the soil’s performance in terms of it’s physical attributes like structural strength, drainage capability and nutrient and moisture holding capabilities. In art and design, it’s often said that the white space around the images and text is often more important than the objects themselves, and a similar rule applies to good soil. In fact the perfect bowling green’s soil will be 50% nothing! By that, I mean that there should be lots of space in the soil between the soil particles. We call this nothingness, Pore Space or Porosity. Some of these pores are big (macro) and some are small (micro) pores. Micro pores are actually classified into two sub groups, but these basic groupings will be fine for now. The Mineral and Organic materials, might make up the structure of the soil, but it’s within the soil porosity that all of the action happens! Last time we saw how the grass plants extract the 16 essential nutrients from the soil solution. The soil solution contains plant usable forms of the essential elements called ions and although these originate in the organic and mineral components of the soil, the plant can’t access them until they are in solution in the spaces between soil particles. That soil solution exists within the micro-pore space. The macro-pore space contains air and is essential for the supply of oxygen to support a healthy soil microbe population as well as for good drainage and resistance to compaction. But what do I mean by soil particles? Stop to look at those sizes for just a minute, because they are quite mind boggling, especially at the lower end where the silt and clay is. Coarse sand has a maximum size of just 1mm, so imagine how very tiny a clay particle is at less than 2 thousandths of a millimetre! Well, that minuscule size hides a big secret and I introduced the intricacies of it when we looked at Cation Exchange Capacity last time. The tiny clay particles are where a lot of the nutrient ions are held within the soil, meaning they can be used by the grass plants later. Clay also plays a role in moisture retention which is critical for the health of the bowling green. To finish today, I will leave you with a very useful visual representation of the relative sizes of these soil particles courtesy of the University of Colorado and next time we will move on to the importance of getting soil texture right in your bowling green. Colorado University diagram showing relative sizes of individual particles for each soil fraction. 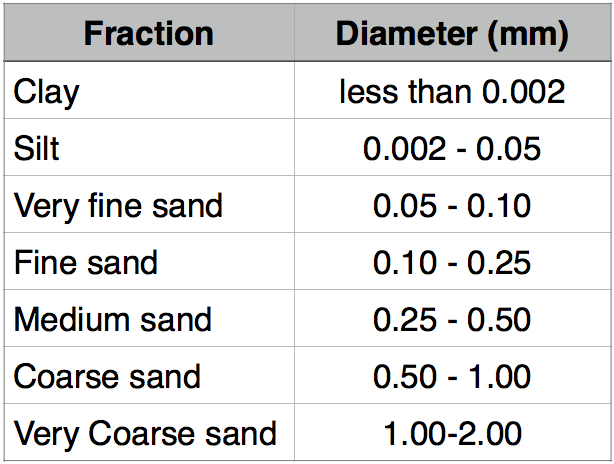 Remember the yellow Coarse Sand particle is just 1mm in diameter. Even blown up to this size, Clay is just a tiny speck! In the previous articles in this series, we’ve discovered how to evaluate performance by simply looking for visual indicators on the turf and by gauging some of the functional attributes of grass plant communities when they form turf. Before we move on to the final stage of this series where we will look at some of the latest and most objective techniques for performance measurement, I wanted to stop for a moment to consider what lies beneath the green layer. All of the functionality and therefore performance of the bowling green depends on healthy turf and turf is of course not just grass plants. Turf is a construct of a healthy grass plant community containing millions of individual plants, growing in a medium that is suited to sustaining healthy growth and reproduction. The medium is, of course the soil our greens are built on; but what is soil? If you look at the pie chart at the top of the article you will see the proportions of what I think of as the perfect soil. 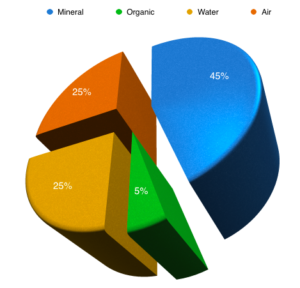 In the diagram you will see that 45% of the soil is made of Minerals. The mineral component of soil is usually made up of a mixture of 3 main groups and these are Sands, Silts and Clays. A suitable mixture of these is critical to the soil’s performance as they dictate the soil’s ability to provide nutrition and moisture to the grass plants and suitable drainage. 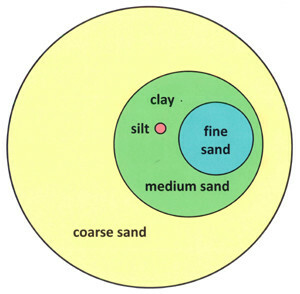 The mix of sand, silt and clay defines the soil’s texture. The organic component will ideally be around 5% and this is made up of living organisms, micro-organisms and dead, decomposing and already decomposed plant tissue (humus). The organic material is added to by the plants themselves as they produce thatch and the soil organisms break this don to release plant nutrients. Then there’s the remaining 50% of the soil to look for, but if you do, it might cause you some confusion, because in the ideal soil the remaining 50% of its volume will equate to nothing at all. In fact it is 50% space, or soil porosity to give it the correct name. Ideally half of this space will be made up of small spaces called micro pores and large spaces called macro pores. The micro pores hold the soil solution which is a mix of water and plant available nutrient ions and the macro pores provide air space and this is where all of the drainage occurs after heavy rain. This air space keeps the soil well oxygenated so that it can sustain a huge population of soil microbes; around 1 billion in a teaspoon of soil. The Sub-Surface Requirements for a High Performance Bowls Green are pretty much set in stone. Get these right and you’re well on your way to a Performance Bowling Green. First of all then, have a look at the diagram above. This represents the ideal make up of a performance bowls green’s rootzone. Do you see anything remarkable? Well, when I explain this to my clients for the first time, many of them are surprised to say the least. If you look closely at the diagram you will see that the ideal green will be 50% nothing; yes space, just air cavities within the soil. Now, of course I am not going to tell you to get rid of half your green to achieve this, but next week I am going to share with you a program whereby you can get close to this ideal situation of ½ solids and ½ space in your green. Of course the space isn’t just nothing; half of the space consists of “micro-pores” and half is “macro-pores”. Put simply the micro-pores contain water and the macro-pores contain air. This is very important to understand and is one of the least understood concepts within sportsturf maintenance. The “nothing” element of the ideal green is the most important factor to get right, because this is where we get the balance between speedy drainage and good growing conditions and it is due to a fundamental misunderstanding of this concept that a very large number of UK bowling greens are in poor condition and can’t be prepared for performance consistently. The only saving grace for these greens is that the UK summer is also very inconsistent and sometimes acts in their favour; so that we occasionally get a very good season’s bowling when the “green has never been better”. This is a false reading in most cases and the problem is exacerbated by the club attributing this success to the latest fad program. provide a natural cycle of nutrient release from soil organisms and micro-organisms (microbes) working on fresh organic matter (thatch). retain the optimum amount of soil water for healthy growth with minimum requirement for artificial irrigation. drain reasonably quickly after excessive rainfall. maintain a tight, dense sward with an upright growth habit which will reduce ingress of moss, weeds and weed grasses. Comprehensive action plan for achieving the above included in the book below. It costs less than a bag of cheap fertiliser.